Civil Rights activists in Los Angeles, California created the United Civil Rights Committee (UCRC) in 1963 following an appearance by Martin Luther King, Jr. at Wrigley Field in that city. Members of the local chapters of the National Association for the Advancement of Colored People (NAACP), the Congress of Racial Equality (CORE) and the American Civil Liberties Union (ACLU) joined together to challenge racial segregation and discrimination. The UCRC primarily targeted four areas of concern: employment discrimination, housing bias, police brutality and school segregation. The UCRC’s first significant demonstration was a Freedom March held in June of 1963. The march, which attracted between 1,000-2,000 participants, was, at the time, the largest civil rights demonstration in the history of Los Angeles. 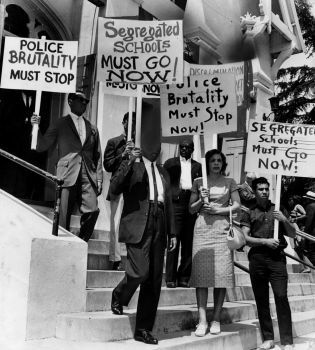 The march targeted all forms of racial segregation and discrimination in the city, but a principal focus was the segregated Los Angeles Unified School District. The march, which began at the First African Methodist Episcopal (AME) Church , ended at the offices of the Los Angeles Board of Education, about three miles away. The UCRC continued a series of marches throughout the summer, but its efforts at school desegregation met with considerable opposition. The following year the UCRC united with other civil rights organizations in opposition to Proposition 14, a measure that sought to repeal the Rumford Fair Housing Act passed by the California Legislature in 1963. Because of racially restrictive covenants, many African Americans in Los Angeles were forced to live in the South Central section of the city. The Rumford Fair Housing Act had been intended to end housing discrimination in California. Real estate interests formed an anti-Rumford coalition that placed Proposition 14 before the voters of California. Despite the efforts of UCRC, Proposition 14 succeeded, thus thwarting members’ efforts to end housing discrimination. The Proposition 14 loss and the failure of efforts at school desegregation, followed in subsequent years by community dissension over the War on Poverty and violence in Watts led to the dissolution of the UCRC. Robert Bauman, From Watts to East L.A.: Race and the War on Poverty in Los Angeles (Norman: University of Oklahoma Press, forthcoming, 2008); Robert Bauman, “The Black Power and Chicano Movements in the Poverty Wars in Los Angeles,” Journal of Urban History, 33:2 (January 2007), 277-295; Josh Sides, L.A. City Limits: African American Los Angeles from the Great Depression to the Present (Berkeley: University of California Press, 2003).